My kiddos love a good coloring activity. Today we are sharing a fall printable that works on recognizing and/or reading color words! There are two versions of this fun Read and Color Activity-- a color version to be used with kiddos not yet reading and a black and white version for children beginning to read. Whether your kiddos are ready to work on their phonics skills or not, it's a fun and simple way to get children recognizing color words all while making a colorful pumpkin patch! 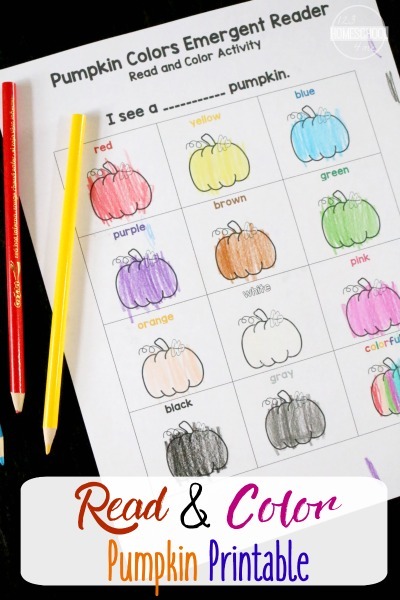 In this Read and Color Activity, your child will practice recognizing color words: red, yellow, blue, green, orange, purple, pink, black, gray, white, and finally, a pumpkin of any/ all the colors! Your child will make a colorful pumpkin patch once he/she has completed the activity, so break out the crayons, colored pencils, and/or markers! Enjoy this festive fall reading printable that reinforces color words! Grab either printable (or both) over at 123Homeschool4Me!